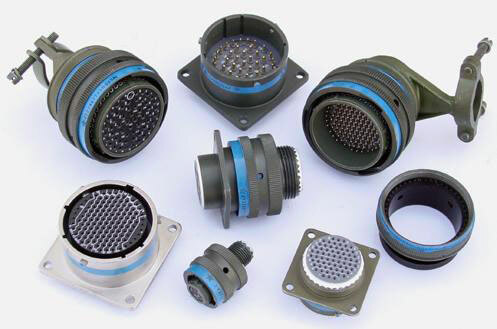 MIL-DTL-38999 testing aims to qualify four series of circular, environment resistant, electrical connectors using removable crimp or fixed hermetic solder contacts with singlemode and multimode fibers. The detail specification tests the construction or fabrication, and materials used to manufacture the electrical connector per MIL-DTL-38999 testing requirements. Series 1: Scoop-proof, bayonet coupling (inch-pound dimensions and measurements). Series 2: Non-scoop-proof, bayonet coupling, low silhouette (inch-pound dimensions and measurements). Series 3: Scoop-proof, triple start, self-locking, threaded coupling (metric dimensions and measurements). Series 4: Scoop-proof, breech coupling (metric dimensions and measurements). Series 1, 3, and 4 consist of connectors that provide electrical continuity between a mated pair prior to contact engagement. The contacts within these connectors are specifically located to protect them damage and accidental electrical contact. Series 2 connectors provide shell-to-shell electrical continuity when mated. Its contour design allows for minimal size and weight of the connectors. A MIL-DTL-38999 connector that is installed within the projectile must with stand the high levels of vibration (per EIA/ECA-364-28) and shock (conditions per EIA-364-27; MIL-S-901 for High-Impact Shock) while in mid-flight. Vibration, Shock, and High-Impact tests the connectors’ mating durability and optical performance. The same required performance levels can also be used during usage while inside a military vehicle. The testing in this design requirement program replicates the potential disruption of the optical signal through the connector.